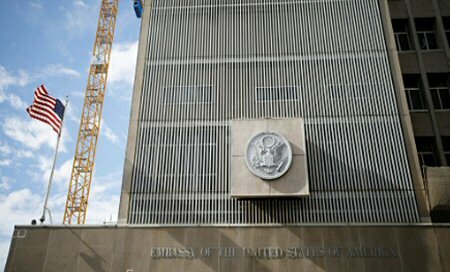 The US Department of State announced, on Monday, the merging of the US Consulate General into the US Embassy in Jerusalem, a step that is evoking the anger of Palestinian leadership. This step follows Secretary Pompeo’s October 18, 2018 announcement that the two missions and teams would be combined. The step evoked Palestinians’ concerns over US administration policy that ignores the Palestinian position on occupied Jerusalem. US President Donald Trump outraged the Arab world and stoked international concern by recognizing Jerusalem as Israel’s capital, in December, and by moving the U.S. Embassy from Tel Aviv to Jerusalem, in May. Palestinian leaders suspended ties with the US administration after the embassy move. The Consulate General in Jerusalem is the top mission for Palestinians, who, with broad international backing, seek East Jerusalem as the capital of a state they wish to establish in the occupied West Bank and the Gaza Strip. According to Al Ray, the spokesperson for the US Department of State, Robert Palladino, stated that the decision was driven by US global efforts to increase the efficiency and effectiveness of their diplomatic engagements and operations, and does not signal a change of U.S. policy on Jerusalem, the West Bank, or the Gaza Strip.